Since the onset of my tennis elbow, I have been modifying my workout regimens to avoid pain and following a rehab protocol to hopefully allow for recovery. The Spring singles tennis season now over, I have decided to give up playing over the summer. And with yesterday’s Chest, Shoulders & Triceps routine, I continued to keep the weights “Katie-light,” as in 3, 5 & 7.5 lbs on most of the exercises. I did increase reps–dramatically–to try to get some burn, but I was successful in avoiding pain while doing the routine and afterwards. It’s actually fun to do P90X with very light weights. My head was clear throughout and I could watch the video. It almost felt like starting something new. Yet through it all, I felt something was missing. What? The pain and suffering. I confess, it’s been quite some time since I visited the dentist for a checkup or a cleaning. And I got to thinking, what’s the point of eating right and exercising if I wake up one day and I’m toothless? No, better to keep those teeth so I can smile with abandon as I enjoy future workouts with Tony Horton. So off to the dentist I went. There, I learned something new. They didn’t put it in these terms, but it turns out that your teeth can be managed as an expense line item (eg: brushing, flossing, twice-yearly cleanings) or a periodic capital expense (fillings, crowns, root canals, Scaling and Root Planing). Either way, you pay. It’s just the expense approach involves no pain and better results. Well, as it turns out, I needed to pay the piper. My penance, for neglecting past visits was/is a two course Scaling and Root Planing treatment. This unpleasant procedure cleans out plaque buildup below the gum-line, allowing for reduced gum inflammation, bleeding and improved gum vitality. The Dental Hygienist attacked one-half of my teeth yesterday over the course of an hour. The procedure began by swabbing the gums with a numbing agent. Yet as the “deep cleaning” began, I experienced the zings of root nerve stimulation. 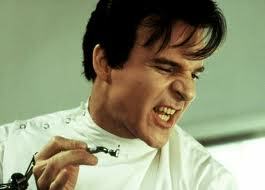 Visions of Steve Martin as the Dentist in Little Shop of Horrors were flashing through my head. Sensing my discomfort, the Hygienist asked if I would like a shot to further numb the area. I readily nodded my assent. That made the remainder of the procedure far less horrifying. Overall, I have to say that this treatment is a good substitute for the tennis elbow-induced “pain gap” I’ve been experiencing these past few weeks. I feel I’m almost back to normal with respect to my above-referenced misery index. Therefore, I intend to continue with the second half of this treatment next week, confident that I will experience no guilt for lack of sufferitude. This entry was posted in P90X/X2 Hybrid, Round 7 and tagged Ab Ripper X, Chest Shoulders & Triceps, Dentist, Little Shop of Horrors, P90X, Plyometrics, Rest, Scaling and Root Planing, Steve Martin, Tony Horton. Bookmark the permalink.